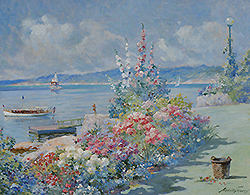 Abbott Fuller Graves was born in Weymouth, Maine and determined early to become a great painter of flowers. His formal art training began in Boston and continued in Paris, where in 1884 he and Edmund Tarbell made their initial study trip abroad. He sought out the most famous flower painter of Paris, Georges Jeannin, to critique his work and eventually joined Tarbell at the Académie Julian, where he studied with Fernand Cormon, Henri Gervex and Jean Paul Laurens. He and Tarbell continued to travel and study together in Europe with frequent trips home to Boston, and Tarbell remained a life-long friend and a major influence. In 1886, Graves began teaching at the Cowles Art School in Boston, where Childe Hassam was also on the faculty and he too became another important influence. Teaching was to remain a major part of Graves’ career; in 1891, he opened his own art school in Boston, which he later moved to Kennebunkport, Maine. Kennebunkport provided a new source of inspiration for Graves’ pictures. Though he continued with the garden and flower subjects on which his reputation had been built, the village and its inhabitants prompted a broadening of subject matter into what we think of today as genre painting. He closed his art school in 1902 and went back to Paris, working there as a commercial illustrator for French magazines between 1902 and 1905, spending summers in Holland and England, and winning a medal in the Paris Salon of 1905. The next year, the Graves’ built a “grand house” in Kennebunkport, in the style of Frank Lloyd Wright. 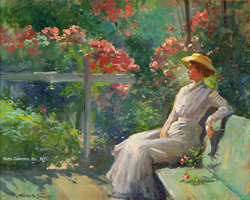 The genre paintings, which had been successful for prints and advertising, gave way to a concentration, once again, on his first love--flowers and gardens, which he was painting with a new luminosity and color. In 1920, the Graves’ moved to New York after a show there had established his national reputation. In spite of the rising tide of Modernism in art, Graves’ poetic flower-filled and dream-like visions held their appeal for critics as well as patrons through the 1920’s. He continued to paint his beloved flowers until his death in 1936, but the combination of the Depression and the vogue for more outré visions had made severe inroads in his success and reputation. Though he never attained the fame and success of his friends Tarbell and Hassam, Graves was nevertheless a painter of note, especially during the 1920’s. Always gregarious, he held memberships in a number of prestigious art groups; the North Shore Arts Association, Copley Society of Boston, a life member of the National Arts Club, Boston Society of Water Color Painters, Boston Art Students Association, the American Art Association of Paris, Allied Artists of America, and the Connecticut Academy of Fine Arts among them. These memberships were finally crowned in 1926 when he was voted into the National Academy of Design as an Associate, and could add “A.N.A.” to his signature. His awards, in addition to his Paris Salon medal, include The Massachusetts Charitable Mechanics Association (1887, 1892), Exposition des Beaux Arts, Paris (1905 medal), Salmagundi Club (1933), and a number of one-man exhibitions in Boston and New York, including four at Vose Galleries (1924, 1925, 1929, 1932). The Brick Store Museum of Kennebunk, Maine featured his work in an exhibit in 1979.